(with Boots, Cloak, Lightsaber) Anakin loses his battle with Obi-Wan Kenobi on the volcanic planet of Mustafar. Gravely wounded, Anakin falls into a burning lava pit and is left for dead. But the gal. . .
(with Lightsaber Handle, Right Hand, Right Hand with Lightsaber) Anakin is now a full Jedi Knight and his heroic feats have made him a hero throughout the Republic. He is lured to the dark side of th. . .
(with Lightsaber, Right Glove Hand, Right mechanical Hand, Cloak) Anakin falls deeper into the dark side of the Force and betrays his Jedi comrades to the evil Sith. On the volcanic planet Mustafar, . . .
(with Missile-Firing Blaster, Missile, Blaster Rifle with harness, Battle-Damaged Chestplate) Specially trained clone troopers operate AT-RTs (All Terrain Recon Transports) on patrol and reconnaissan. . .
(with Display Stand) As adminstress and chief aide to Commerce Guild President Shu Mai, Cat Miin oversees the distribution of raw materials to the Separatist Droid Army. She accompanies Shu Mai when . . .
(with Bowcaster) The Wookiee warrior Chewbacca battles beside fellow warrior Tarfful to save their home planet from the invading Separatist forces. Yoda leads the courageous fight to save Kashyyyk fr. 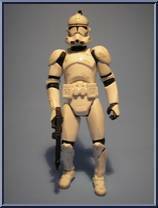 . .
(with Visor, 2 Blasters, Rifle, Shoulder Pauldron, Kama, Grappling Hook, Rope) An elite officer in the clone army, the clone commander leads a squad of clone troopers into battle against the Separati. . .
(with Firing Cannon, Projectile, Blaster) Clone trooper pilots are specially trained for the skills needed to fly attack and troop ships. 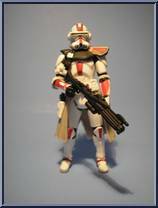 As part of the Grand Army of the Republic, the clone pilots e. . .
(with Blaster Rifle, Blaster Pistol, Interchangeable Shoulder Armor) Clone Troopers are the genetically engineered soldiers that are the Grand Army of the Republic. They are sent throughout the galax. . .
(with Blaster, Antenna) Equipped for all terrains and environments, the genetically engineered clone troopers combat the relentless droid armies of the Separatists. They are led into battle by the Je. . .
(with Blaster, Rifle, Harness, Waistcoat) Commander Bacara is a clone commander who works alongside General Ki-Adi-Mundi against the Separatist droid armies on the planet Mygeeto. Though he fights be. . .
(with Visor, 2 DC-17 Blasters, Rifle, Shoulder Pauldron, Kama) Equipped for battle on the exotic fungus planet of Felucia, Commander Bly fights alongside Jedi Knight Aayla Secura. When the secret Ord. . .
(with Blaster, Antenna, Missile-Firing Cannon, Missile) On the planet of Kashyyyk, Commander Gree serves Jedi Master Yoda and helps the Wookiees fight the invading Separatists. When the secret Order . . .
(with Lightsaber, Lightsaber Blade, Cloth Cape, Cloth Skirt) Giving up everyone and everything he cares about, Anakin falls to the dark side. Encased in the black armor that will come to strike fear . . .
(with Missiles) Destroyer Droids are designed for one purpose only; the complete annihilation of their targets. With twin blasters and protective shields, they are a deadly threat to Republic forces. (with Removable Hood, Force Effect, Force Lightning, Lightsaber) The Supreme Chancellor expands his power and controls the Galactic Senate. As the Clone Wars rage, he sets into motion the final part . . .
(with Lightsaber, Blaster, Cape, Exploding Body) The supreme commander of the droid armies is tracked to Utapau by Obi-Wan Kenobi. A powerful combination of droid and alien, Grievous is a formidable . 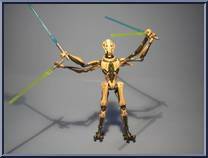 . .
(with 2 Green Lightsabers, 2 Blue Lightsabers) General Grievous is the supreme commander of the droid armies and a brilliant military leader. He hunts Jedi for sport and wears their lightsabers as tr. . .
(with Electrostaff, Cloak) General Grievous is surrounded by droid bodyguards. They protect the commander of the droid armies with impenetrable electrostaffs as the Republic forces attempt to stop th. . .
(with Lightsaber, Lightning Effect) Mace Windu is a courageous fighter and respected member of the Jedi Council. In a desperate attempt to save the galaxy, Mace leads a daring confrontation against S. . .
(with Energy Bolt, Blaster Rifle, Display Stand) To guard their secret base, the Separatists enlist natives of Mustafar as sentries against potential intruders. Armed with long blaster rifles, the Mu. 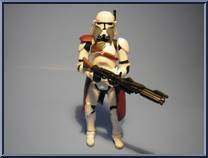 . .
(with Helmet, Battle Staff) Neimoidian warriors are specially trained members of the Neimoidian Gunnery Battalion. Commanders have distinctive armor befitting their rank and are armed with special Ne. . .
(with Rifle, Projectile, Helmet) Neimoidian warriors are specially trained members of the Neimoidian Gunnery Battalion. They are armed with special Neimoidian weaponry that is being mass-produced for. . .
(with Lightsaber, Display Base, Kicking Pole) Obi-Wan Kenobi goes to the volcanic lava planet of Mustafar to confront Anakin Skywalker, who has fallen to the dark side. The two friends are now fierce. . .
(with Lightsaber Handle, Right Hand, Right Hand with Lightsaber) Obi-Wan Kenobi is a Jedi Master and a General in the Clone Wars. 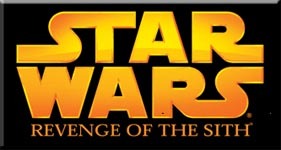 He embarks on a dangerous mission to stop General Grievous in an atte. . .
(with Lightsaber, Lightsaber Hilt, Headgear, Jedi Cloak) Aided by his droid R4-P17, Obi-Wan Kenobi flies an Eta-2 Jedi starfighter on a mission to rescue Supreme Chancellor Palpatine. His acute Jedi . . .
(with Interchangeable Heads and Hands, Lightning Effects) The Supreme Chancellor encounters questions about his ultimate motives. During a confrontation with Mace Windu, he uses his deadly powers and. . .
(with Display Stand) This humanoid senator once served the Galactic Republic. Argente later committed the forces of the Corporate Alliance to aid the Separatists in battle. He is instructed to go to . . .
(with Electronic Lights and Sounds) R2-D2 accompanies Padmé to Mustafar as she tries to persuade Anakin to return to the side of good. The loyal astromech droid witnesses a tragedy that has mo. . .
(with Lifting Arm, Droid Parts, Booster Rockets, Display Stand) The feisty droid R2-D2 is assigned to serve Anakin Skywalker in the Clone Wars. Seated in the droid socket of Anakin's Jedi starfighter. . .
(with Right Arm, Right Arm Cannon, Projectile, Blast Effects) Manufactured by Count Dooku, the tough, deadly and durable super battle droids are used by the Separatist forces in battle. These droid a. . .
(with Firing Bowcaster, Projectile, Club) The heroic Wookiee tarfful helps the Republic forces when the Separatist droid armies invade his home world of Kashyyyk. Serving under the command of Yoda, T. . .
(with Firing Cannon, Missile, Bandolier, Loincloth) The Wookiees are intelligent, fiercely loyal and exceedingly strong. When their peaceful planet of Kashyyyk is enveloped by the Clone Wars, these f. . .
(with Wookiee Blaster, Shield, Bowcaster, Missile, Bandolier) The Wookiees are intelligent, fiercely loyal and exceedingly strong. When their peaceful home planet of Kashyyyk is enveloped by the Clon. . .
(with Lightsaber, Cloak, Firing Cannon, Missile) The wise Jedi Master Yoda leads the Republic's clone army into battle on the Wookiee world of Kashyyyk. He is assisted in this fateful mission by migh. . .